I could totally take him in a fight. Founding Father or not, that guy was tiny. “I wish! 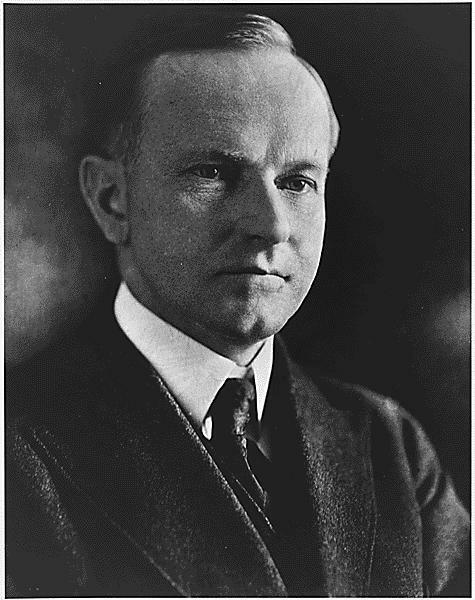 Coolidge was taller.” Then I stopped. While my unnatural affection towards the Sphinx of the Potomac is not exactly a secret, I generally remember who I’ve annoyed with stories of his brilliance. “How do you know I’m a Silent Cal kind of gal?” I asked suspiciously. “I was Facebook stalking you,” he said. It was a harsh reminder that Facebook stalking goes both ways. For every profile picture I’ve analyzed, someone has scrutinized mine. For every comment I’ve critiqued, someone’s been critiquing mine. On the one hand, it’s nice to know I’m not some weirdo, obsessively checking everyone else’s pages while mine sits untouched in a dusty corner of the internet. On the other hand… Gah! There’s no way I’d ever be able to take down the weird stuff I’ve left all over Facebook. I’m like a slug leaving behind a slimy trail of crazy. 1) Have you ever stalked yourself? If I’ve added you as a Facebook friend, chances are I’ve stalked you pretty thoroughly first (maybe even in real life) (Kidding!) (Mostly. ), and I’ve probably stalked myself from your perspective. I swear I have a good reason: It’s ok if a new friend sees a picture of me in jail. It’s less ok if someone I need to impress, like a potential employer, sees that same picture. 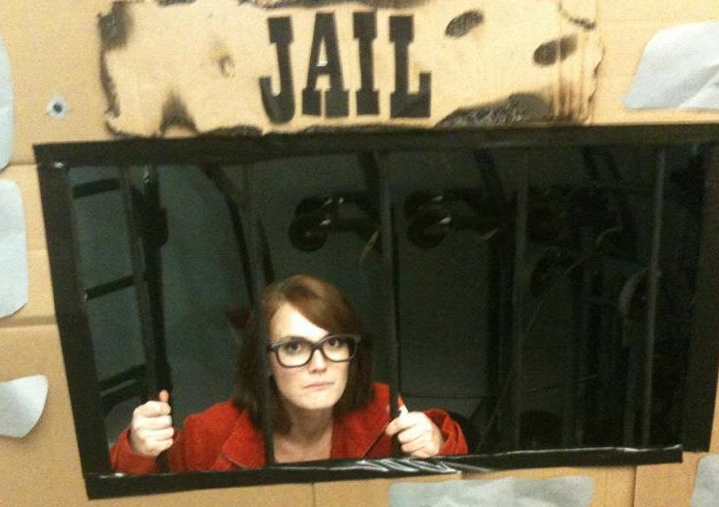 Unless they want to hire me to make old-timey Western jails out of cardboard, because in that case, I’M YOUR GAL. The issue occurs when I take that too far and over-stalk myself. I think I’ve spent more time looking at my page from someone else’s point of view than I have looking at anyone else’s from my point of view. Calling myself a Facebook narcissist would imply I like what I see. My page is never good enough. My profile pictures aren’t photogenic. My album titles are stupid. My relationship status hasn’t changed in so long that the heart icon has been replaced with an ice cube. I stress over it. I want people to look at my life– I wouldn’t have a page if I didn’t– but I don’t want them to look very hard. Ideally, I’d like everyone to think, “Hmm, she has her moments” after a cursory glance and then move along. This is not the droid you’re looking for. 2. Have you ever brought something you found through Facebook stalking up in a real-life conversation? Something you absolutely should not have known? Sometimes I can’t remember what I learned on Facebook and what someone told me in real life, so when we’re having a conversation, I have three options: 1) I can either keep quiet, 2) I can forge ahead and bring it up, hoping it’s not something I read in a six-month-old wall post by a friend of a friend, or 3) I can try to steer the conversation so they’ll mention it, which makes the entire chat ridiculous because I’m just trying to get someone to tell me something I already knew. It’s never a big piece of information like a marriage, or a new baby, or a job; it’s always some stupid little thing I suddenly have to talk about, like the fact that they like eggnog, or that their grandma’s cat died. And for some reason, it’s never, ever related to Calvin Coolidge. WHAT GIVES? 3. Have you ever been so convinced you’re going to mention one of those pieces of information that you freeze up and can’t function? Last spring, I was about to go on a date with a guy I really liked. (This date, actually.) He had tattoos, gauged ears, and hipster glasses– a deadly combination for me. My friend Dillon was not as easily impressed and insisted on some pre-date Facebook stalking. Secret service agents are not vetted as thoroughly. Dillon went so far back on this guy’s profile that he was able to tell me the name of his childhood pet. I spent the whole date freaked out I was going to accidentally bring up the dead dog he hadn’t posted anything about in years. 4. Have you ever Facebook stalked an ex and wound up feeling worse? I don’t mean right after the breakup, when you should stay away from Facebook at all costs. I mean months later, when you think, “Self, you’re so over that. You’re the comeback kid.” To prove how over it you really are, you engage in some light Facebook stalking. At first you’re smug. “Oh-ho! Moved to a lame city, I see. Working a minimum-wage job, I see.” Then things go south. Your ex has been hitting the gym. He’s surrounded by attractive people in his pictures, people who post hilarious things on his wall. Everything is the worst. You’re not winning at life, you’re a Facebook-stalking monster no one will ever love! Damn you, Facebook. Damn you. …I have to go edit my page now. P.S. : You kind of want to know which presidents shared your height and BMI, don’t you? My friend, you’ve come to the right place. I am quite content with most resembling Truman and Teddy Roosevelt, in terms of height and BMI. Thanks for a much needed smile at this ungodly morning hour. Now I need to go clean up my facebook. I always push the possibility of not-so-appropriate info probably being part of the public sphere to the back of my mind. I assume that no one is paying attention, but now I am paranoid thanks to you. It’s probably a good thing. I’m pretty sure I’m in love with your blog. I laugh so hard every time you post. Being a Nut Magnet that’s afraid to commit, I was exhausting my supply of clever metaphors to describe the ex girl friends. ‘..like a slug leaving behind a slimy trail of crazy”, is priceless. I’ll give you credit when I use it. That whole presidential height thing would have totally worked on me. The quirky humor on this blog is off the freaking charts, I can’t stand it! Haha always a treat to read. I died when I read “I’m like a slug leaving behind a slimy trail of crazy.” Keep up the silliness! Love the jail shot, You don’t look like you belong there! absolute genius! I love coming in to read this blog! I do realise however, that i agonise over every single facebook update as to whether it’s appropriate to share or not. Then I come to blog world and spew all the intricate details of my life all over the internet. (Granted, only about 3 people read it, but still…) Double standards??? This has to be one of the best posts i have read in a while & yes sadly done all 4 points of the Facebook stalking. I also find point 4 can also reference people you went to school with as well! Hahahaha classic! Really great post! I’m with Teddy R and you’re man Calvin! BTW been there, done that re: facebook stalking. It’s kinda fun in a sad stay-at-home-loser kinda way. You know I meant your… not you’re… right? 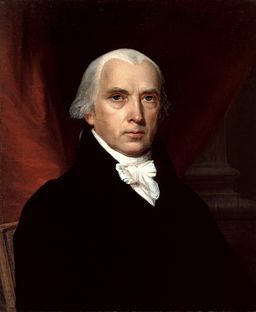 How was James Madison so tiny? A BMI of 17? I’m closest to him, but sad to say my BMI is a bit higher. I’ve added you to the weekly quote round up on my blog,because “slimy trail of crazy” is some kickass prose. Thanks for the laugh. Truly hilarious. Thanks for sharing!